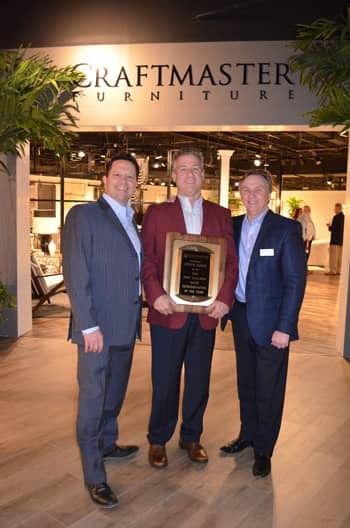 Pictued L to R: Alex Reeves, Senior VP of Sales and Merchandising; Steve Davis, Craftmaster sales representative for Michigan, Indiana and Ontario; and Roy Calcagne, President, Craftmaster Furniture. The award is given in honor of Tony Galliher, a Craftmaster sales manager who passed in 2009. About Craftmaster Furniture: Craftmaster was founded in 1972 in Taylorsville. It is a subsidiary of Samson Holdings, which also owns case goods resources Universal Furniture and Legacy Classic Furniture. For more information, visit www.cmfurniture.com.